The Department of Health said in a statement that the cases "involved two people who resided or stayed at 104-60 Queens Boulevard." "One person recovered, and one elderly person with health conditions died," the agency said, adding that it is currently working with building management "to test the building’s hot water plumbing system." The agency said it couldn't provide further details about the people who contracted the disease. Parker Towers residents said the Department of Health began distributing notices dated Sept. 20 inside the building on Wednesday afternoon, advising residents that they can still use and drink water. It noted that those who are 50 or older and those whose immune systems are weakened should take extra precautions, including taking baths instead of showers to avoid water vapor. The agency did not specify when the tenants contracted the disease, but sources said they were diagnosed sometime between June and September. One resident was outraged to learn about the outbreak. "I'm livid," said the female tenant, who did not want her name to be used. "We have a lot of elderly people here whose health could be compromised." The agency said it was planning to organize a meeting for tenants, if they wanted one. "While the risk of infection to tenants is very low, as part of our protocol, the Department will notify residents about the investigation and next steps," the agency said. Legionnaires' disease, which is a type of pneumonia caused by Legionella bacteria, is typically found in water systems, city officials said. The disease it is not contagious, and people can only get sick by breathing in water vapor containing the bacteria, the Health Department said. Each year, the city receives an average of 200 to 400 reports of the disease, which causes flu-like symptoms, such as fever, cough and difficulty breathing, and is easily treatable with antibiotics, the agency said. The city is obligated to notify tenants when there are two or more cases reported at the same address in a one-year period. 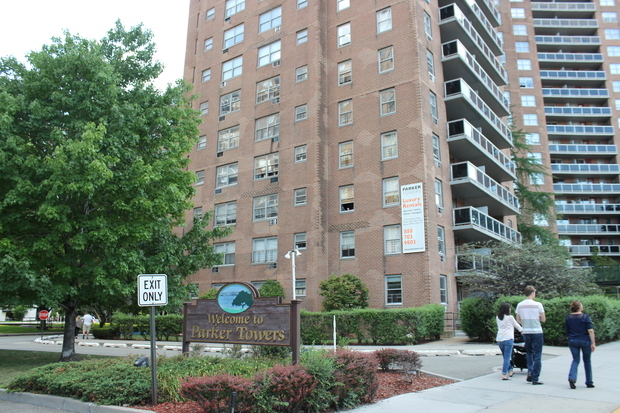 Last month, the city investigated the water at a Rego Park building after two residents became sick with Legionnaires' disease. The largest outbreak took place in 2015 in the South Bronx, killing 12 people and sickening more than 120. It was later traced to 15 cooling towers. The agency noted that Parker Towers has no cooling tower. A person answering the phone at Parker Towers referred DNAinfo New York to the Health Department's Community Affairs Unit.